Studies in physiology and medicine. [edited by] Stokes, William, (1804-1878). London : John Churchill & sons, 1863. Description : [1 l.] pl., xxxiii p., 428 p. ; ill.: 1 phot. ; 22 cm. 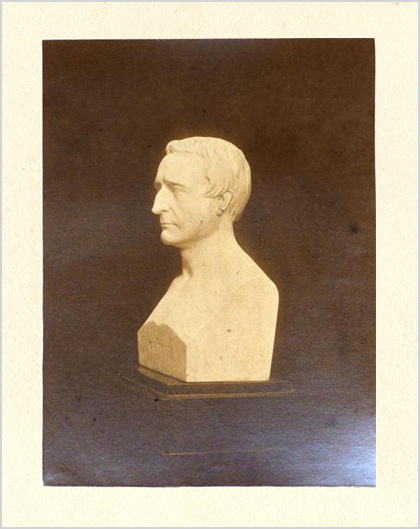 Photograph : mounted sepia albumen of a marble bust of Graves, sculpted by John Hogan (1800–1858). Author caption: By the late Robert James Graves, F.R.S. ; Professor of the institutes of medicine in the school of physic in Ireland. Founder (with Stokes), Irish school of medicine. Cofounder, editor, Dublin Journal of Medical Science, 1832. Eponym: Graves disease, 1835 (GM-3815). System of clinical medicine, 1843 (GM-2218). President, Royal College of Physicians of Ireland, 1843, 1844. Fellow, Royal Society of London, 1849. Author caption: Edited by William Stokes ; Regius professor of physic in the University of Dublin. Medical training, Meath Hospital, Dublin. Treatise on disease of the chest, 1837 (GM-2213). His thesis introduced Laennec system of stethoscopy to Ireland (GM-2674). Fellow, Royal Society of London, 1861.